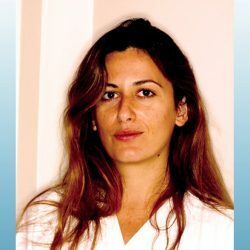 Dr. Marianna Kontopodi graduated from the Dental School of Aristotle University of Thessaloniki in 2005. After her graduation she moved to Brighton (UK), where she started working as a general practitioner in a private clinic. Working as a general dentist she soon decided that her passion was in the field of aesthetic dentistry and applied to New York University College of Dentistry, one of the best universities in the world, where she worked with some of the best and world-wide famous professors such as Jonathan Levine, Denis Tarnow, Steven David and others. In 2008 she returned to the UK where she started working in private clinics in London as an aesthetic dentist and at the same time occupied the position of Visiting Lecturer at the department of cosmetic dentistry at the University of London (UCL). In 2010 she moved back to Greece. Since then she has been working as a free-lancer in dental clinics in Athens and in Crete while still practicing as a visiting lecturer in continuing education seminars. Marianna is a member of the American Association of Aesthetic Dentistry and a member of the General Dental Council in the U.K.